Instead of using whipped cream, or cream cheese, try mixing fat free ricotta cheese with some sweetener (sugar twin, stevia, splenda), flavor drops or sugar free syrup or sugar free pancake syrup, and a bit of cinnamon. The same applies for baking and baked goods (pancakes with yogurt and pudding instead of oil are amazing). Try adding some cocoa or chocolate protein powder for a chocolate whipped cream (check my store for my favorite, but I recommend BioX Power Whey Isolate and Iso Sensation 93 Chocolate Fudge). Or, try topping with sugar free pudding (like Kozy Shack, Jello), or Greek Yogurt. A mere 2 TB of whipped cream (who only eats 2TB?) has 104 calories and 11 grams of fat, of which 7g are saturated. 1/4c of Fat Free Ricotta has only 50 calories and less than 0.5g of fat. Light Ricotta only has 70 calories and 3g of fat; even the full fat has fewer grams of fat per 1/2serving than 2TB of whipped cream. Jello Sugar Free Pudding Cups average about 60-70 calories for the whole cup, and have less than 2g of fat. The vanilla is excellent when left in the freezer until it is semi-frozen with cinnamon stirred in. These come in a wide variety of flavors, and are excellent toppers of cakes/protein cakes/toast/oatmeal/oat bran, waffles, toast, and even mixed into cereal. 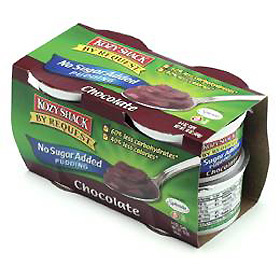 Kozy Shack has excellent, creamy tasting sugar free pudding cups (refrigerated isle- usually with dairy). They range from 60-100 calories and are full of flavor. These are satisfying, creamy, and thick! Stir in some cinnamon!!! FYI TIP* Adding pudding to baked goods replaces a lot of the cream/butter/oil by keeping your baked good moist! A full cup of Greek Yogurt has about 130-150 calories and about 22g of protein. Make sure you add some sweetener, preserves, sugar free syrups/pancake syrup, and cinnamon. Stir it well until it is creamy and cinnamon is incorporated. Adding fruit flavored syrup or sugar free jam/spread is fantastic as well. Few things beat eating cereal (rice krispies/special k,shreddies etc) with pudding and yogurt (dessert!). For those who don't mind a bit more tang, try Quark. This naturally low fat soft (unripened) cheese is a fantastic topping for waffles! I grew up eating Quark on waffles with maple syrup drizzled on top and fresh sliced strawberries. 100 grams of Liberte's fat free quark is only 60 calories and has 11g of protein! It tastes similar to fromage frais or Baker's Cheese and has no salt added to it. It does have a great, thick texture, and a tangy/sour taste which is a great contrast to adding agave or sweetener to it. Quark is an EXCELLENT substitute in making Cheesecake (there a quite a few recipes online), cheese tarts (sweet) and clafoutis, as well as desserts made with marscapone (try a half/half split). It makes a great dip and base of sauces (sweet of savory, depending on what you mix it with). Try adding it to soups that require cream or sour cream. Many European recipes (dessert especially) use this instead of or with sour cream/cream cheese (Especially German and Polish desserts); it is sometimes called topfen, tvorog/tvaroh, and biezpiens. It is excellent in pound cake/coffee cake/sponge cake! Google Quark dessert, or Quark Cheesecake... you'll be baking in no time! Cheesecake that is truly good for you! Tip= caramelized, grated apples with cinnamon and sweetener are a fantastic add in!